Half a century ago, the 1969 Venice Biennale was rocked by student demonstrations, street battles and strikes at the height of the American war in South East Asia. Artists boycotted the official events, and the Giardini’s exhibition gardens were closed down by police following threats to torch the pavilions. Many of the exhibiting artists withdrew works, pavilions were closed and the official prizes were abandoned. At the time, the visionary museum director Pontus Hulten saw these circumstances as positive: ‘There was a general sense of hope that the future could happen only via the necessary destruction of the past.’  Today Italy is once again the epicentre of global tensions, positioned as a frontline state in relation to both the EU debt and the refugee crisis. What kinds of boycotts are possible today, and what might a pavilion lockout achieve if staged during the 2019 Venice Biennale? Such questions are prompted by a provocative proposal from the Indigenous Australian artist Richard Bell, titled We Don’t Really Need This/BELL Invites. 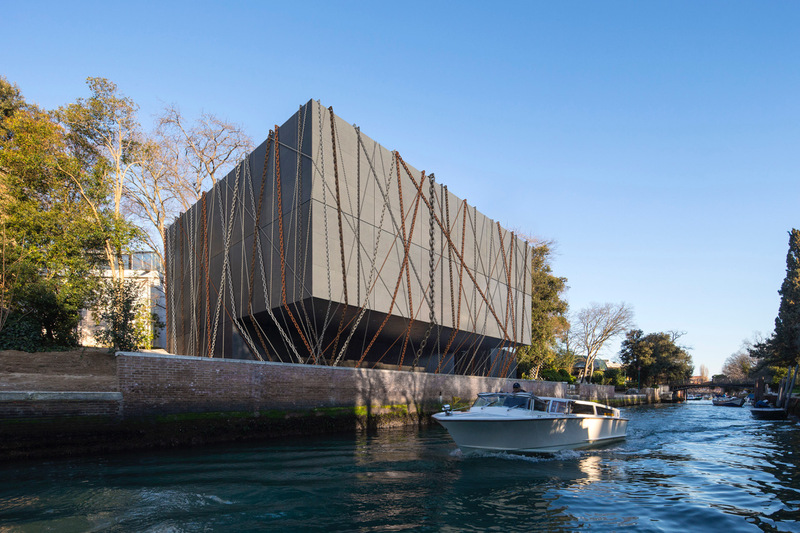 The artist conceived of transforming the Australian Pavilion into a monumental sculpture by wrapping it in chains; and then staging Embassy: Bell Invites on the island of Certosa for three days in May and November 2019. Bell’s idea was among one of the five proposals shortlisted by the Australia Council, and when it was not successful he went public, literally rattling the chains. His proposal (co-authored with Indigenous curator Clothilde Bullen, Zoé De Luca and Josh Milani) was pasted onto the walls of the National Art School Gallery in Sydney, overwritten with outraged comments, such as ‘we don’t need another mission manager’ and ‘I much prefer the black armband to the white blindfold’. Following its airing, Bell has set about crowd funding in order to execute the second part of the proposal, which he describes as ‘a search for solutions’. Given Bell’s intervention and its capacity to unravel the more democratic attempts by the Australia Council, as well as to overshadow the official representation in 2019, it deserves attention, particularly as the episode reveals a radical Indigenous attempt to intervene in global cultural politics. Will this alternative staging be seen as the act of an avant-garde trickster or that of an Indigenous activist, or both? What of it as art? And what of its politics? The Venice Biennale still retains something of a crusty aura as the first and most prestigious international biennale for contemporary art in the visual arts calendar. The selection of artists, particularly for each national pavilion, is a source of endless speculation, given the weight of expectations that selection will project a local artist onto the global stage. Australia, after half a century of exhibiting in a temporary, suburban-sized house, commissioned a new ‘black box’ Pavilion from architects Denton Corker Marshall, which was launched in 2015 with much fanfare and benefaction. Following two biennales, in which Fiona Hall, in 2015, and Tracy Moffat, in 2017, represented Australia, the Australia Council made the decision to change the selection process for the 2019 Venice Biennale, from a commission to a competitive process of inviting artists and curators to make proposals. The new, more democratic order was launched amid heated public debate as disaffected benefactors of the relatively new Pavilion complained of being sidelined by the Australia Council. By November 2017, over seventy proposals from artists were received by the Australia Council, which was a vote of support for the new open selection procedure. Five were shortlisted (I was a curator on one of these), with each receiving five thousand dollars to present more detailed submissions. In May 2018, the jury, headed by Callum Morton, a previous Venice Biennale artist, announced the successful artist as Berlin-based performance artist Angelica Mesiti, curated by Copenhagen-based Juliana Engberg. Engberg had previously curated Morton, Susan Norrie and Daniel von Sturmer at the 2007 Venice Biennale and so would have been considered an experienced hand at such international events. It is the second part of Bell’s proposal, EMBASSY: BELL Invites..., that negotiates this space, and which, as the only part that may be realised, will potentially offer a space of transformation. EMBASSY: BELL Invites… takes its name and character from the historic camp that was established forty-five years ago when four Aboriginal activists, with nothing more than a beach umbrella and a hand-made sign, set up the Aboriginal Tent Embassy in Canberra outside Federal Parliament on Australia Day (now known as Invasion Day) in 1972. As ‘foreigners’ in their own land, the Tent Embassy camp has continued to this day as an embarrassment to white Australia occupying the otherwise pristine centre of the Federal Capital’s civic landscape. In Venice, Bell proposes to redirect his project to an alternative site: that of Certosa, an island some distance from the official Giardini Park. 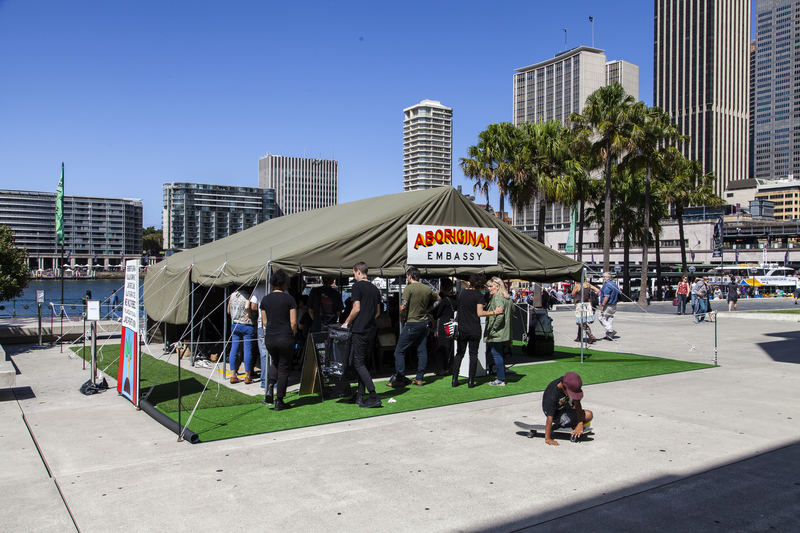 Instead of occupying the National Pavilion, he proposes to erect a tent EMBASSY. The move represents not only a self-imposed exile but engages in a form of Indigenous diplomacy, in collaboration with Clothilde Bullen who is to curate a public programme of conversations with selected First Nation artists, cultural producers and activists. 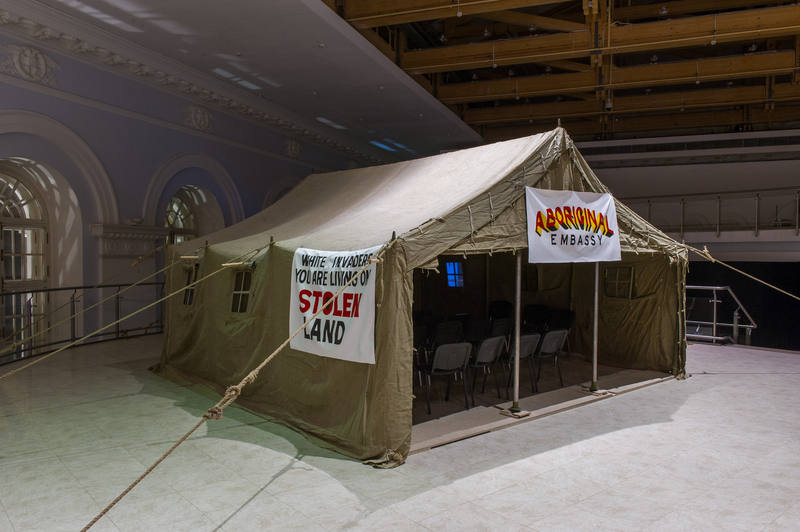 In fact, since 2013 Bell has travelled EMBASSY across many sites; using a tent erected at strategic locations in biennales and exhibitions to host a public programme of conversations and debates. The previous outings include such international art events as the Moscow Biennale in 2013; Performa, New York in 2015; the Jakarta Biennale; the Sonsbeek International in Amsterdam; the Stedelijk Museum; and the 20th Biennale of Sydney in 2016; and the New School, New York in 2017. At each site invited guests were engaged in conversation. Through such a dialogical process, Bell imagines the possibility of art regaining a function as a collective practice of freedom, exercising its powers of negation and playfulness. Accompanying Bell’s proposal is Bullen’s curatorial rationale, framed by chilling photographs of chained Aboriginal people in a grid of global slavery imagery. Bullen focuses on Bell’s act ‘as a disavowal of the nationalism upon which colonialism (and the Venice Biennale) is based’, describing how, as an Indigenous artist, he has been ‘unstintingly fearless in addressing uncomfortable truths’ in negotiating questions of authority, identity, custodianship, trauma, and ‘the commodification of Aboriginal art’. She describes the artist as not just ‘an elder of his community but indeed a kind of Godfather in the Indigenous arts community’ and characterises his invitation to her as a younger Wardani/Yamatji Aboriginal curator, as an ‘inter-generational inter-cultural vision’, effectively creating the first all-Indigenous team at Venice. As we now know, the Australia Council was not prepared to take this leap to recognise and grant responsibility to an Indigenous avant-gardist. Richard Bell’s project has negation at its core, in abandoning the white space of the Pavilion, it rejects the norms of cultural exchange and circulation. Bell’s negation, in breaking out of the confines of accepted modes, releases into the public domain many questions. It challenges the transparency of selection. It asks whether risk is ever considered a desirable factor in such processes. In its refusal to signify, it confronts the audience with their own expectations. 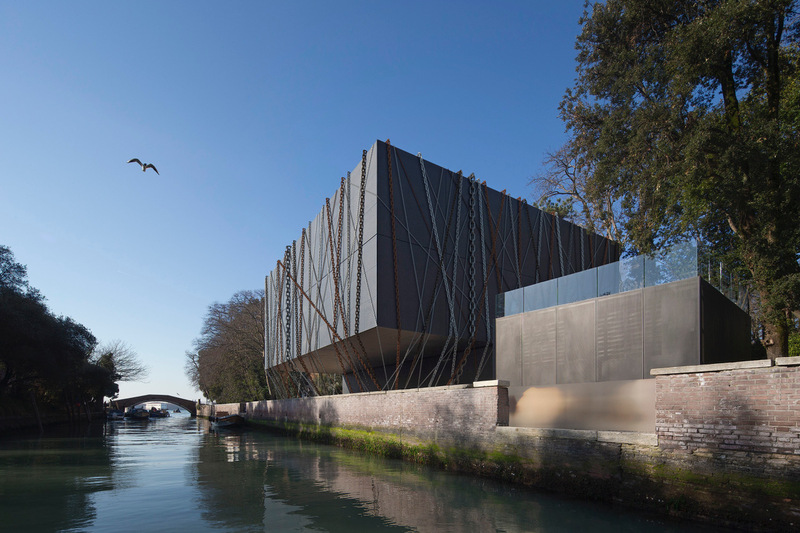 The idea of the monumental, bound pavilion/sculpture becomes a multi-valent image that hovers not only above the Venetian canal as a foreboding image, but over the Western art world. For like Pandora’s box, it threatens to release a plague when unbound and opened. Its empty centre recalls the discredited colonial concept of terra nullius. Such avant-garde negation, as the art historian John Roberts proposes, is a response to ‘the very “asociality” of art under capitalism, the fact that for art to remain art (rather than transfer itself into design, fashion or social theory) it must experience itself as being “out of joint” both with its place in the world and within its own traditions.’  Such disturbance has the potential to open up the present order (in this case that of the Venice Biennale) to other possibilities. The open-ended programme of Indigenous diplomacy offered by EMBASSY: BELL Invites… would allow the viewer to share in a process of reflection and dialogue, which may overshadow the official Australian Pavilion. Richard Bell, Proposal Venice Pavilion 2019, 2018, p 5. All subsequent quotes from the artist and curator come from this document. Ann Stephen is Senior Curator of Art, The University of Sydney. Her books include On Looking at Looking: The art and politics of Ian Burn (The Miegunyah Press/Melbourne University Publishing, 2006), Modernism & Australia: Documents on Art, Design and Architecture 1917–1967 (The Miegunyah Press/Melbourne University Publishing, 2007), Modern Times: The untold story of modernism in Australia (The Miegunyah Press/Melbourne University Publishing, 2008), and Bauhaus Diaspora and Beyond (forthcoming 2019), the latter three edited with Philip Goad and Andrew McNamara. Her writing has been published in a range of international anthologies and journals, including Art History, and with Zwitscher-Maschine, the online journal on Paul Klee (www.zwitscher-maschine.org/journal/).